A reloading press and a set of Lee Dies are all you need to start reloading. Lee Dies are complete with powder measure, shell holder and complete instructions, including load data that tells you how much and what type of powder to use. Dies and presses last a lifetime, so buying on what your budget allows makes the most sense. You will never regret buying a value priced press—as no matter how sophisticated a press you own—you always have need for a simple press for odds and ends jobs. If you mount your press with the Lee Bench Plate, your second press is always at the ready. 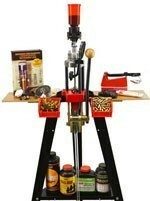 If you don’t have a workbench, consider the Lee Reloading Stand, built for the ultimate in rigidity and convenience. We have aggressively priced kits that contain everything you need to get started. The Lee Anniversary Kit, Breech Lock Challenger Kit, Value Turret Press Kit and Classic Turret Press Kit. With any kit, only dies are extra. We highly recommend Lee Dies as they are the only ones that include a shell holder (except Lee RGB dies), necessary for presses to use the dies. Most Lee dies also include load data and a powder dipper that is appropriate for most loads on the data sheet. If loading rifle cases, we recommend the purchase of the appropriate case length gauge to use in conjunction with the case conditioning kit that comes with the Anniversary, Breech Lock Challenger, Value Turret Press and Classic Turret Press kit. In combination, this tool ensures that cases don’t get too long to cause potential pressure problems.